Growing up in the 1970s in Connecticut, my Dad would always buy me a Hess truck for Hanukkah. 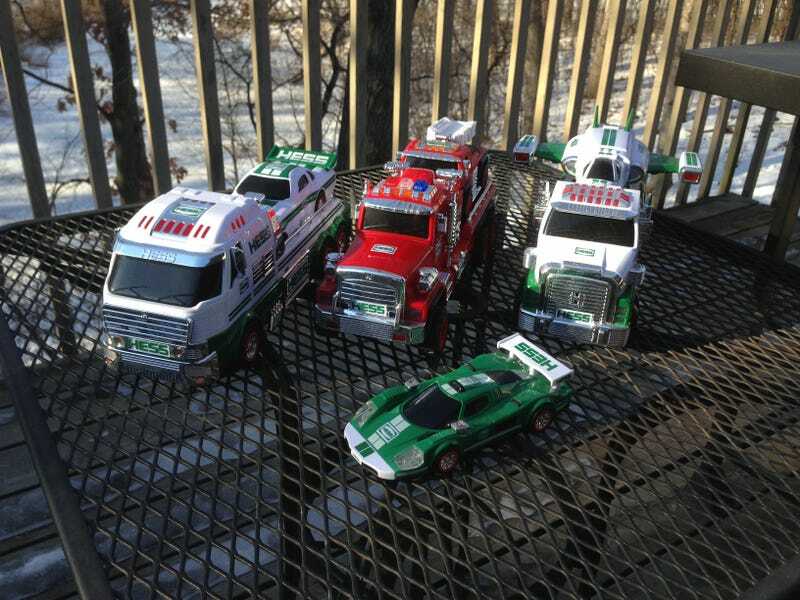 Hess is a primarily east coast oil company, and you could purchase their holiday trucks and cars at their gas stations. Because I was a young kid, they were just toys, and were treated accordingly. All of mine are long gone, but my Dad – now living very close to us in Minnesota – started mail-ordering them for my own young son/his only grandson three years ago; the standalone race car was found at a Goodwill store in Arizona (of all places) by a buddy of mine. Either last year or the year before was the 50th anniversary of “the Hess trucks.” While not strictly diecast models, the level of detail is astonishing for the dollar amount: LEDs everywhere that can shine or blink at the flick of a switch; sirens and sound effects, including the clank-bang of the ramps pulling out; the smaller cars feature pull-back motors. The technology has certainly changed over the years, but much of this detail can be found in the vintage models as well.